Find out more about RidgeGate’s visionary plan, design guidelines, construction timelines and more. RidgeGate is a mixed-use sustainable community that spans over 3,500 acres on the east and west sides of I-25 in Lone Tree, Colorado. What makes RidgeGate unique is our dynamic blend of urban and open. In fact, over a third of RidgeGate’s land area will be permanently dedicated to open space, parks, trails and preserved land. It’s a healthy balance with residential neighborhoods and retail villages, office districts and cultural amenities, including the Lone Tree Arts Center and the new Lone Tree Library. RidgeGate will grow carefully, with a long-term commitment to walkability, livability, access, amenities and scale. RidgeGate is a walkable community smartly connected to the RTD Southeast Light Rail line, which helps residents and workers reduce their dependence on cars. In fact, three new light rail stations will come to the RidgeGate community in spring 2019 with the completion of the RTD Southeast Light Rail Extension project. Our distinct urban amenities, combined with open space, bluffs, parks, and mountain views, make RidgeGate a community designed for health, wellness, and peace of mind. 2. Where is RidgeGate located? Located along both sides of I-25 just south of Lincoln Avenue in Lone Tree, Colorado, RidgeGate is nestled against the bluffs that create the natural edge for metropolitan Denver. RidgeGate will offer the culture and connectivity of an urban environment balanced with ample open space and sweeping views of its natural Colorado setting. It is located within the highly regarded southeast corridor in close proximity to the Denver Tech Center (10 minutes), Centennial Airport (10 minutes) and Denver International Airport (30 minutes). 3. What is smart-growth and why is RidgeGate considered a smart-growth community? Smart growth refers to the design of new communities that balance the presence and location of economic, environmental, social/housing and transportation elements with physical design, providing a more responsible and efficient means to accommodate growth. RidgeGate is a mixed-use community, which means the community is designed to integrate mass-transit (including light rail), a variety of living options, and a mix of retail uses, offices, schools, cultural facilities, parks and recreation – all within close proximity. A network of bike paths and walking trails connect all areas of RidgeGate with its neighbors, helping to reduce traffic and fostering a sense of community. 4. What are the public transportation options? RidgeGate is a transit-oriented community with easy access to downtown Denver, the Denver Tech Center, Denver International Airport, and other nearby amenities via surface and rail transportation. The community is pedestrian, bicycle and mass transit friendly with parks and retail areas located near residential areas to encourage walking. RTD is constructing 2.1 miles of new track and three planned light rail stations in RidgeGate, including one just north of RidgeGate’s Sky Ridge Medical Center, and two additional stations further south, including an “end-of-line” station at the RidgeGate Parkway interchange on the east side of I-25 that will feature 1300 parking spaces. Currently, the Lincoln Station light rail stop just north of Lincoln Avenue and I-25, one half-mile north of RidgeGate, serves the community. RidgeGate’s light rail access allows residents and employees to catch a train and commute directly to downtown Denver in just 25 minutes. Currently RTD provides regular scheduled bus routes throughout the community, as well as the by-request FlexRide bus service throughout the RidgeGate neighborhoods. Visit www.rtd-denver.com for route maps, schedules, fares and details about the Southeast Rail Extension project. The Lone Tree Link free shuttle service connects key employment centers along Park Meadows Drive, like Charles Schwab and Sky Ridge Medical Center, with Lone Tree restaurants, retail, and the Lincoln light rail station. The shuttle is free to the public and picks up every ten minutes, Monday through Friday at five stations along the Park Meadows corridor in Lone Tree. In addition, the Link On Demand service allows residents to request free rides anywhere within the City of Lone Tree by simply using an app on their phone. 5. What type and how many homes will be built in RidgeGate? When completed, the RidgeGate community will have approximately 12,000 homes and a wide variety of commercial and office development. In RidgeGate’s West Village (the two square miles west of I-25), approximately 2,500 homes are planned in total, with the majority of these homes already built. A wide variety of housing options are available in the West Village, including single-family homes, patio homes, luxury homes, condominiums, apartments and town homes. The eastern side of RidgeGate will be developed gradually, with many additional residential options added to the mix. 6. How long will it take to complete RidgeGate? The development of RidgeGate’s West Village is now nearly complete. Additional development in the eastern portion of RidgeGate is coming to life now, with an estimated build-out period of 40 years. This paced build-out is the result of RidgeGate’s thoughtful development strategy, with a desire for quality over quantity or speed of development. 7. How much commercial development will there be? When complete, there may be as much as 20-23 million square feet of commercial use in RidgeGate that will include shopping, dining, civic, educational and entertainment facilities. RidgeGate’s West Village will include approximately 5 million square feet of the total commercial development. 8. What is complete in the community? Sky Ridge Medical Center, a major regional medical campus with a Level III Trauma Center, medical offices, children’s emergency room and state-of-the-art surgery, imaging and obstetric facilities, opened in RidgeGate in August 2003. Sky Ridge Medical Center employs more than 1,300 people and is a magnet for other businesses who wish to locate in RidgeGate. The hospital’s presence in our community both enhances property values and ensures the provision of high quality medical services to area residents. In 2015, Sky Ridge Medical Center completed a $117 million expansion effort, bringing more beds, operating rooms, an office building and additional parking to the facility, among other improvements. The Lone Tree Recreation Center, a $17 million, 54,000-square-foot recreation center built by South Suburban Parks and Recreation District, on land provided by RidgeGate, opened in May 2004. The facility provides a recreation pool and lap lanes, group exercise classes, state-of-the-art strength training and cardiovascular equipment, arts and crafts courses, childcare and day camps, and flexible community rooms, among other amenities. The first phase of Lincoln Commons, RidgeGate’s mixed-use shopping district that includes a new SuperTarget, opened in October 2005. A second phase, Lincoln Commons North, opened in 2009, adding another 100,000 square feet of local shops, restaurants, and office space in a walkable, village setting. And in 2013, the RidgeGate Commons retail district opened at the southeast corner of RidgeGate’s West Village, anchored by the outdoor goods superstore Cabela’s. 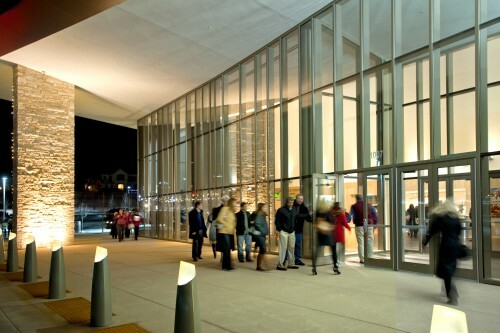 2011 marked the completion of the $23 million dollar Lone Tree Arts Center, situated on the west end of RidgeGate near the Lincoln Commons retail area. RidgeGate Investments, the private owner of the land being developed by Coventry, donated the land for the new arts center, recognizing the important contribution the state-of-the-art facility would make to the region through presentations of theater, music, dance and multi-disciplinary performances. A new Lone Tree Library, by Douglas County Libraries, opened in summer 2016. The 25,000 square foot contemporary building features community meeting spaces and an outdoor patio. The new Charles Schwab campus opened in 2014, and is now home to more than 2,000 employees. This makes Schwab the largest private sector employer in Douglas County. The beautiful campus features 650,000 square feet of LEED- certified office space in three five-story buildings, plus a modern retail branch building for their customers. In early 2019, Kiewit Corporation announced its plans to build a new regional office adjacent to the Sky Ridge Light Rail Station. The office will be the workplace for around 1,100 employees. Over a dozen residential neighborhoods are now occupied in the community, representing a diverse blend of architecture from attached and courtyard homes to single-family detached homes, ranging from the low $300s to $1 million, with apartments and single family homes available now. 9. What is under construction? New single-family homes by Century Communities at The Retreat at RidgeGate are under construction now. In addition, several new commercial developments are underway, including the new Kiewit Corporation regional office at Sky Ridge Station, The Pinnacle medical office building near Sky Ridge Medical Center, as well as other mixed-use projects offering new retail, restaurants and everyday services to the community. 10. Is there a Homeowners’ Association? Yes, there are two master community associations. The RidgeGate West Village Community Association covers all homes west of the Willow Creek corridor, and the RidgeGate Central Village Community Association covers areas to the east. Per the Community Charters, the Associations provide for a flexible system of standards and procedures for the development, expansion, administration, maintenance and preservation of the community. Within their structures are the basic services for CenturyLink’s fiber optic communication network to homes, financial management of the community including common area maintenance, monitoring the property for compliance, long range planning for the future replacement of capital assets, and management services for the daily operations of the community including the collection of assessments. 11. Are fees charged to the homeowner for services provided by the Association? 13. How will I find out about what is going on within the community? Good communication between the Board of Directors, the HOA Management Company, the Rampart Range Metropolitan District and of course, your neighbors all lead to building an outstanding community. Residents are invited to join the community conversation on Facebook, Twitter, and Instagram(@ridgegateco) and an active neighborhood social network on Nextdoor.com is in place. 14. Is trash service included in the monthly assessment? Actually, the City of Lone Tree is one of only two cities in Colorado that provide trash service to homes at no additional charge. Once your closing date has been established, residents should contact the City to ensure that their service begins as soon as possible after their closing. 15. Does my landscaping have to be approved by the Community Association? Yes. Any exterior change to homes in RidgeGate will require approval by the HOA, including the addition of your landscaping. Landscape completion deadlines will be provided to you both prior to closing and in your welcome packet. An application and a landscape plan must be submitted and approved by the HOA prior to installation. 16. In what school district is RidgeGate located? RidgeGate is located within the Douglas County School District. With the continuing growth within the City of Lone Tree and Douglas County, it is recommended that residents contact the Douglas County School District office to determine details about school location, transportation to and from schools as well as other services the District may offer such as before and after school care. 17. How can I contact my Community Association for questions? Management Specialists, Inc. manages the RidgeGate West Village Master Community Association and the accounting only for the RidgeGate Central Village Master Community Association. The following neighborhoods are service areas within the RidgeGate West Village Community Master Association, and are managed by Management Specialists: Bluffmont Green, Bluffmont Heights, Lincoln Park, Parkside and Renaissance. If you live in one of these five neighborhoods and are looking more information, contact Management Specialists, Inc.via their website at www.rwv.msihoa.co. All questions and concerns regarding these Master Community Associations or your Service Area within the RidgeGate West Village Master Association can be directed to the Management Specialists office via their website at www.rwv.msihoa.co. 18. Can I rent out areas in RidgeGate for my business or family gathering? Yes. Various amenities within RidgeGate are managed by different entities. To inquire about renting the Lincoln Park Clubhouse (available to residents of neighborhoods within the RidgeGate West Village Master Association), contact Management Specialists via their website at www.rwv.msihoa.co. To inquire about renting, or using, areas of Belvedere Park, contact Denise Denslow with Rampart Range Metro District at 303.779.5710. To inquire about renting, or using, areas of Prairie Sky Park, visit the South Suburban Parks and Recreation District website. The Lone Tree Recreation Center, Lone Tree Arts Center and Lone Tree Library also have meeting space available for a fee. Contact the Lone Tree Recreation Center at 303-708-3500, the Lone Tree Arts Center at 720-509-1000, and the Lone Tree Library at 303-791-7323 for further information.